Better Boulder believes the design of the City’s built environment is essential to establishing a high quality of life. Well-designed urban places can help to foster community, encourage economic vitality, and create desirable environments where people can live, work, and play. There is not a “one size fits all” solution to urban design in the City of Boulder. The surrounding context and functions of different parts of the City inform what the proper design solution for that area should be. For example, the built environment in south or east Boulder might look quite different than that found on Pearl Street. There are, however, unifying characteristics of quality urban design that we believe are universal in their applicability. We believe that our public places should encourage exchange, both formal and informal, between people. Accessible – able to be enjoyed by people of all ages and mobility levels. Comfortable – providing a strong sense of personal safety, and ease with ones surroundings. Connected – providing multiple pathways to multiple activities, resources, services, and places. Engaging – creating a visually rich atmosphere allowing people to connect with one another. Vibrant – an environment that is pulsating with life, vigor, and activity. Buildings should be oriented towards the street, and designed to interact with it at the pedestrian level. Including entryways to buildings on the street level, along with glazing, and other architectural enhancements can help to accomplish this goal. Utilizing an alley, or another access point behind the building to access parking can help to ensure the public realm in front of the building is engaging. Streets should be designed to reduce the speeds of automobile traffic and improve safety for all modes of travel. Street crossings should be narrow, either because the street is narrow or because bulb outs are used. Minimizing the number of travel lanes and the size of travel lanes along with the number of turning lanes can all help to achieve this goal. Crossing a street should not be a long, scary proposition. 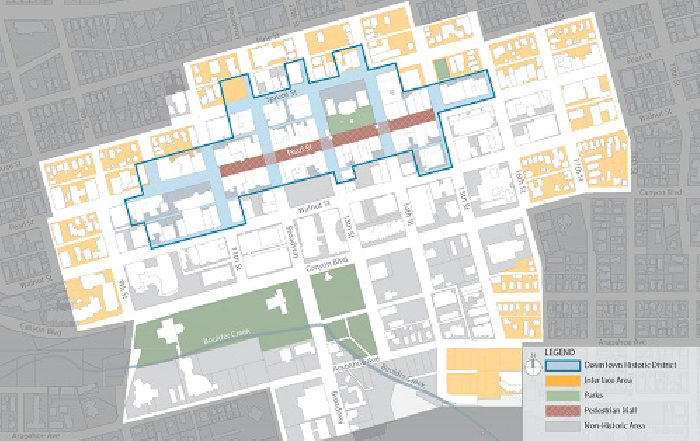 An interconnected network of streets, sidewalks and pathways to provide multiple ways to arrive at a destination. Include space for all modes of travel including, pedestrians, bicycles, transit and automobiles. It should be easy and desirable for people to walk and bike on any street in Boulder. Innovative measures like Green Bike lanes, bike corrals and bike boxes should be more prevalent. All streets should have sidewalks and some bike facilities. Higher traffic streets can utilize bike boulevards and shared streets should be employed when possible. Curb cuts and mid-block conflicts with traffic should be limited. Traffic signals should be timed to accommodate bikes and peds. There should be ample bike parking close to the front doors of all destinations. There should be street furniture where peds can rest or wait (especially at transit stops). Transit stops should be clearly marked with bus routes, destinations and arrival time. A route map would be a great addition.